“Ganpati Bappa Morya” when we hear Ganpati Bappa, we all can’t stop ourselves from chanting these mystical word “Morya Morya” then we know that we have seen the magic of “Ganeshotsav”. No doubt that we all love this festival more than any other, because it is the festival of joy, celebration and togetherness. Few people like us who are staying in Germany and are far away from our motherland, deep down we feel that somewhere something is wrong, and we know that we are going to miss all this festive magic, then why can’t we give a thought of bringing this same magic to the Germany? We all need VISA to cross borders but, not our Bappa, we can’t go to our friends house but we can always make few new ones, we can’t bring back the good old days but we can always make few new memories. We can’t match Kaka halwai sweets but there is no harm in trying one. We might even forget words when we are singing Aarti but we still get the feeling. When we smell the mist of festival in far away land then we all have a shivering sensation all over our skin. When we find that our heart is beating at its highest note, then we know this all because of joy involved in celebrating this festival. Then why not to bind this joy in shackles of language, region, and in order to make it more memorable why note include people from different country in our case few Germans and make them say it loud Morya Morya Ganapati Bappa Morya. Since its inception is all about bringing people together, exchanging ideas/thoughts. This celebration was never new to us but it was the first among all to make us realise the real importance of it and hence justifying the title Borderless Ganeshotsav. It was like a lightning idea which stuck during casual lunch time discussion about the upcoming Ganesh festival, and we all planned to implement the same over here in Germany. Even though everybody was a Engineer, it was surprisingly well planned. Maintaining the tradition of Ganesh Mandal, we first printed the receipt books and vargani/chanda was collected. With this it marked the beginning of our first year of “Koblenz Tarun Mitra Mandal”. Later we realised that we don’t get idol in Germany and this was not going to stop our ignited minds. Where there is a will, there is a clay to make idol and surprisingly this clay was given to us by our German friend who was enthusiasts to witness the celebration with us. With many thanks to YouTube we were able to prepare the Idol after couple of attempts, and thereafter, finally the idol was ready. And here we begin our three days celebration. Day1: Finally the day arrived and everybody was excited about it. The decoration and other preparations were on. For the first day the aim was to keep it as simple as possible. 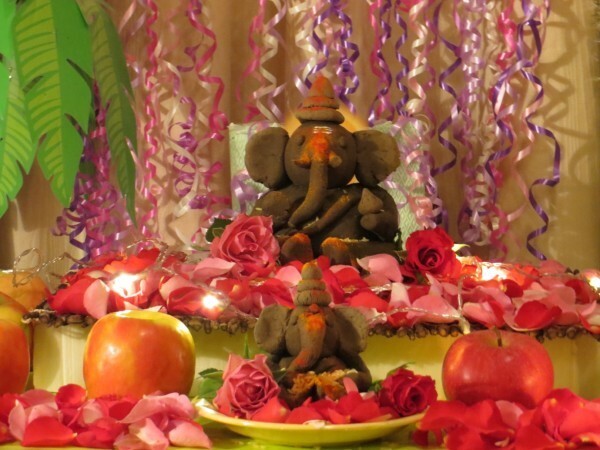 The decoration was made with simple lighting, fruits, flowers and a chakra which spun behind Ganesha’s head(by grace of god it worked for 3 days). Aarti plate and other arrangements were made in advance to avoid any last minute rush. It took 3 engineers efforts to make prasadam. The energy in room was tremendous. Then the series of bhajans and shlokas/stotras were enchanted and our German friend was enjoying the atmosphere and was trying to enchant the same with us. Day2: This day the scene was as if Ganesha is sitting on the throne of flowers and it all looked like he was the ultimate source of all these colours and fragrances. With this theme of decoration we again enchanted series of bhajans and shlokas/stotras. Day3: The Visarjan Day and on this day approx 40 people from different parts of India who were staying here in Koblenz Germany we involved in preparing delicacies which were famous in their local regions. It was mouth watering aroma all over. And on this day Ganesha was surrounded with these food items and was looking like he was enjoying the same. The day progressed with Lunch followed by few cultural activities. And the time had come to say good bye for our beloved Ganesha and we decided to say goodbye in our traditional way of immersing the idol in river called Rhine-Mosel sangam, It could not stop us all by saying Ganapati Bappa Morya,Pudhchya Varshi Lavkar Ya…!!! Culture is not in our soil, it is not in our water, it flows in our veins. When we do the Visarjan and when water touches us, we don’t care if it is Ganga or Rhine, you are just left with heart full of joy and happiness. Sumedh, Amit, Omkar & Kedar hails from Belagavi currently in Germany. It is Awesome. Keep it up. Let the festival celebrated all over the world… Ganapati Bappa Morya….